With the seemingly never-ending winter this year, is it possible that springtime temperatures have finally sprung? We’ll be optimistic and assume “yes!” With the warmer temperatures, many start to think about gardening and growing fresh, local food. If you’ve never grown your own food but want to enjoy the satisfaction of doing so along with the great taste, you may need some help or have questions. Fortunately, we’ve got the perfect event for you. 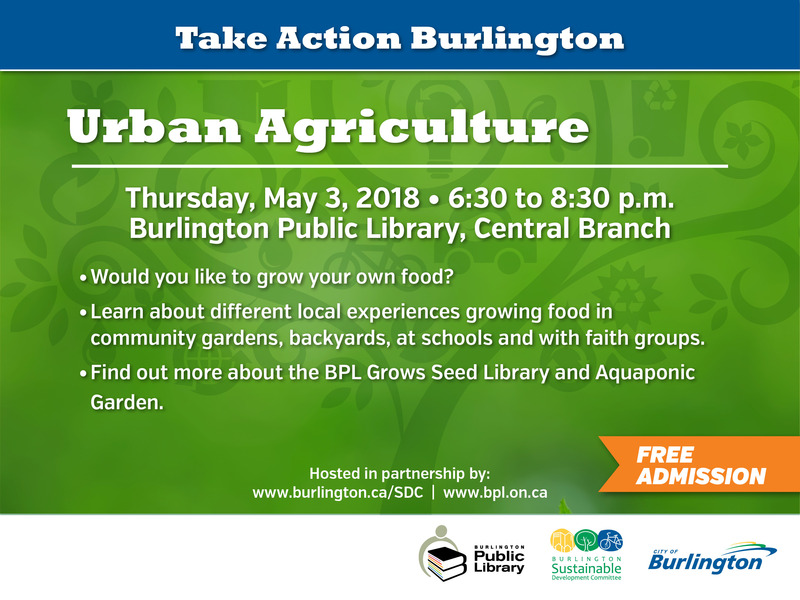 The Burlington Sustainable Development Committee in partnership with the Burlington Public Library are hosting an event on urban agriculture. Speakers will share their experience growing local food in community gardens, backyards, at schools and with local faith groups. Burlington Central Library staff will also speak about their seed library program and aquaponic garden. Bring your questions as there will be plenty of time for discussion and to speak one-on-one with presenters at their display booths. 6:30 to 8:30 p.m. Doors open at 6 p.m.
Burlington Public Library, Central Branch, Centennial Hall, 2331 New St. The event is free but registration is required. Please email environment@burlington.ca or call 905-639-3611 ext. 1321 to reserve your seat. Take Action Burlington! Collectively we can work together to learn how to grow local, nutritious food.